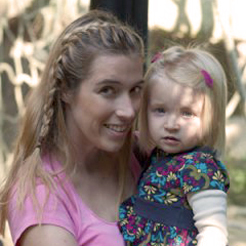 Eating meals at home as a family is something that is very important to us, but it can be difficult to manage with our crazy weekday schedules. 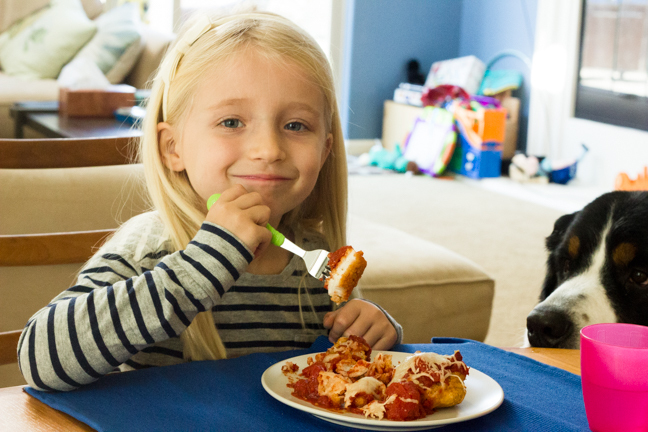 Working meals around two working parents, a preschooler and activities galore for every member of the family can make it hard to sit down to a home-cooked meal every weeknight. But with a little extra thought going into the weekly plan at the grocery store, along with some freezer goodies like Tyson® Fully Cooked Crispy Chicken Strips, we can make quick, delicious meals on the spot! One of our favorite quick meals to make is 20-minute Chicken Parmesan. 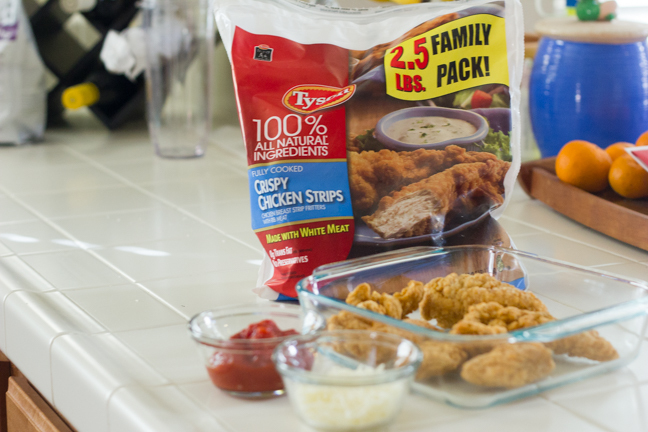 Tyson® Fully Cooked Crispy Chicken Strips make it that much easier to make, and feel good about making it, too. They’re made with healthy, all white meat chicken raised with no added hormones or steroids, and even better, they’re in the freezer right at our fingertips when we need them. We simply toss some chicken strips in a baking dish, add pasta sauce and shredded mozzarella, and bake for 18-20 minutes. The chicken is already full cooked, so you’re really just warming it up and getting all of the ingredients to meld together! Another favorite in our house is Chinese Chicken Salad. This is a dish that someone always seems to order out at our favorite restaurants, so we thought we should save money and time by making it at home instead! 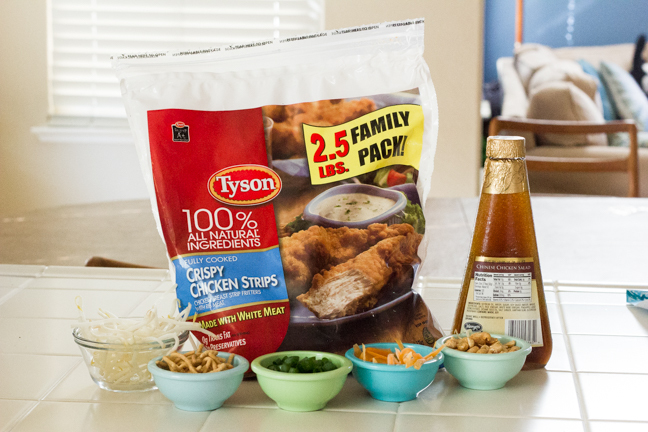 This time, the only 20 minutes you’ll need is to bake the Tyson® Fully Cooked Crispy Chicken Strips in the oven! While it’s baking, shave some carrot strips, cut some green onions, and gather up some crispy noodles, peanuts and bean sprouts. When your chicken is ready, slice it into strips and toss all of the ingredients with your favorite ready-made spring mix salad and store-bought Chinese Chicken Salad dressing. Now we can all sit down to the table and enjoy the meal together instead of hurrying around the kitchen making dinner, or spending money on fast food once again. 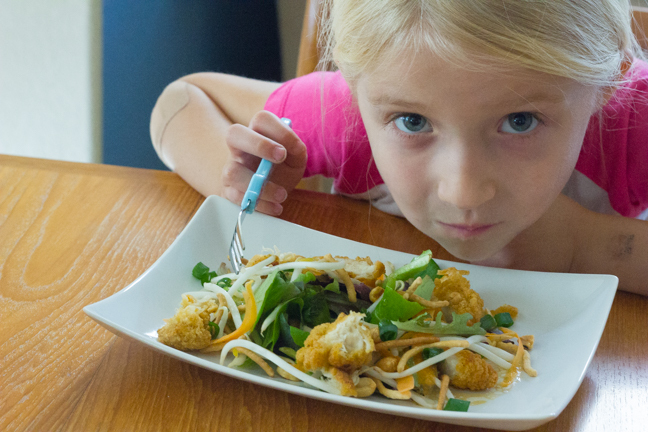 My daughter loves the at-home version better because of the crispy, home-style breading on the chicken strips, as opposed to the plain grilled chicken we get in restaurants. And even better, this is a meal that my daughter can actually help make in the kitchen. And in our house, any meal that she touches has a much higher chance of being devoured! 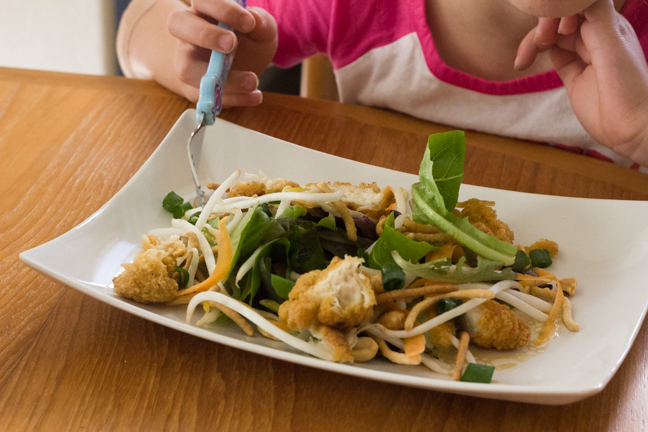 Hopefully you’ll be inspired to eat a few more meals at home and make your own quick masterpieces with Tyson® Fully Cooked Crispy Chicken Strips!